A part of our lives…. from time to time..
You can fight it, but not for long…. Find quiet in the midst of it.. It is possible to find quiet in chaos. Imagine walking down a busy street being quiet within, while the chaos of busy traffic, hawkers and shoppers swirls all around you. You can do that. All it takes are some practices. Close your eyes – focus on your breathing, hearing, what you see and what you taste. Allow your thoughts to come and go, without judging them. Turn your attention to what your senses are experiencing. Take deep diaphragmatic breaths. Inhale to a count of four. Fill your belly with air and then move up to your chest. Hold your breath gently for a count of four , then exhale to a count of four. Repeat this several times. It helps to calm your nervous system and makes you relaxed. Make time in your daily routine for quiet time and try to keep this time sacred. This is your time and don’t be embarrassed to tell others that you need it. Find a favourite place for this practice – a sacred space in your home, a park, a beach – it all depends on where you are. Spend time repeating calming phrases (thanks Sandra!) and then a few minutes of complete quiet and stillness. I have found that as you keep practicing this, you long for this time and space and you might even consider lengthening the time in due course. Music can be so calming and healing, especially when we are afraid to be alone with our thoughts. Make yourself comfortable, switch on the music and listen. Your mind will begin to wander, naturally. Slowly bring it back to the music, becoming aware of the sounds and the silences. There are plenty of guided meditations you can undertake to calm your mind and body. Try this 3 minute one (YouTube video) . Progressive muscle relaxation that helps you relax all of the muscles in your body. A relaxed body, relaxes your mind. This video has a guided practice that you can do regularly. Visualizing a calm space is a great way to relax and not to be sucked into the chaos around you. During visualization, you form mental images to take a visual journey to a peaceful, calming place or situation. You can use as many of your senses in this process. For example, you can imagine yourself at the ocean – hear the waves, feel the warmth, smell the salt water, etc. One suggested practice involves imagining leaves floating on a the surface of a stream of water. When worried thoughts come to mind, mentally place each thought on a leaf and allow it to float down the stream. So there you have it. Finding quiet amidst chaos is just a matter of practice! Do you use any of these practices? Linking in to the #1Word Blog Linkup hosted by Lisa of The Golden Spoons and Janine of Confessions of a Mommyaholic. What a terrific piece Corinne! I shared this everywhere. As you can see I have a lot of catching up to do today! Heading off to read more. Thanks, Rena. So appreciate the shares too. Great tips! I definitely did some deep breathing this week to help me work through the crazy chaos of the week! If the chaos is external I take a deep breath and I retire to my room to find some quiet. Listening to soft music and guided meditation are new for me to try out. This is a very helpful post. Thank you Corinne for posting these 7 practices. Great ideas! I like that you give us links so we can go see if something hits our fancy! I have a friend who taught me to take a few minutes each day, get lost into the art of making a pot of tea, then sitting with a pretty tea cup and saucer and meditating on the good things that happened that day. Thank you for reminding me to find that peace within! Glad you liked them, Nan. That tea meditation sounds good. I must try it out. Thanks for sharing. 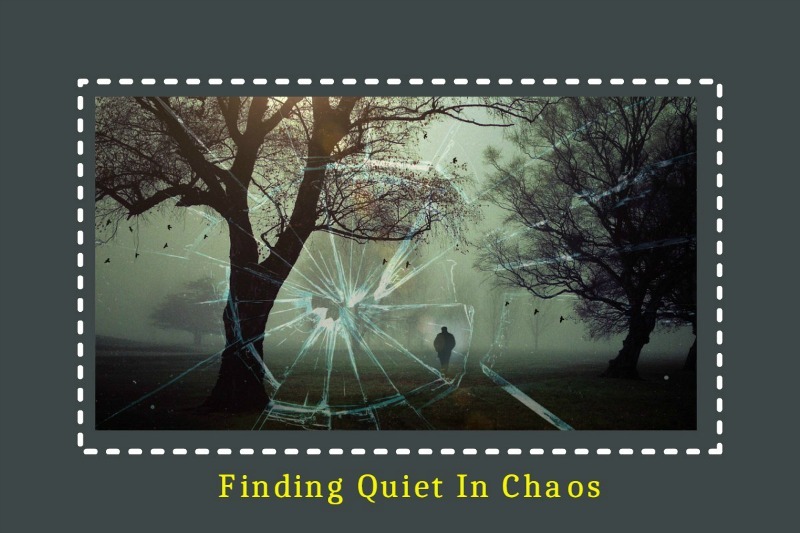 I love your suggestions for finding quiet amidst the chaos and you are right sometimes you just can’t help, but have a bit of chaos befall us, but still it is how you handle it that makes the difference. I’m glad you found them useful, Janine. I enjoyed the challenge of responding to to this prompt. Great tips…Useful for finding quiet in chaos. You’re on the right track, Naba. It’s showing in your writing too these days. Loving the authenticity of your words.